On this special episode of the ASC Podcast with John Goehle we discuss the 2019 Proposed Changes to ASC Payment Systems and Quality Reporting Programs. 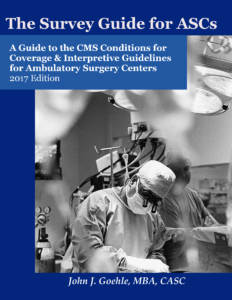 CMS published the proposed rule this last week and there are SIGNIFICANT ramifications for the ASC industry as well as some good and bad news about payment rates, depending on your specialties. With this episode, we will begin the discussion of the new regulations, and their impact on the ASC Industry. Note that throughout this episode we will be discussing various CPT-4 Codes. CPT, better known as the Current Procedural Terminology is a copyright of the American Medical Association and all rights are reserved by the AMA.